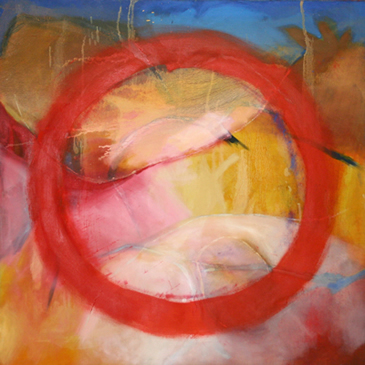 This abstract oil painting is a bridge between two different styles, controlled and more open. The big red circle is about more solid, fixed states of mind, with a big dollop of ego, and also energy. It also connects with the Zan Enso, or circle, but has none of the spontaneity and naturalness of an Enso painted by a real meditation master. Mine wobbles, psychologically speaking. It says a lot about my mind at the time, which is why I still find it interesting.